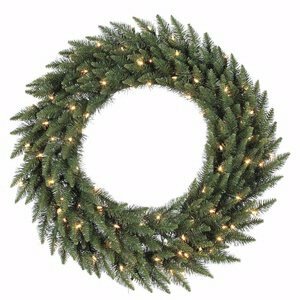 72-Inch Camdon Fir Wreath With 1020 Tips, 400 Clear Dura-Lit In/Outdoor Lights. 1020 PVC Tips. Dura-lit Lights utilizes microchips in each socket so bulbs stay lit even when some bulbs are broken or missing. 1 Year Limited Manufacturer warranty. Made in China. Item Weight is 26-Pounds. Northlight Pre-Lit White and Red Outdoor Christmas Wreath with Warm White LED Lights, 36"
Vickerman Durango Spruce Artificial Wreath with 200 Warm White LED Lights, 48"